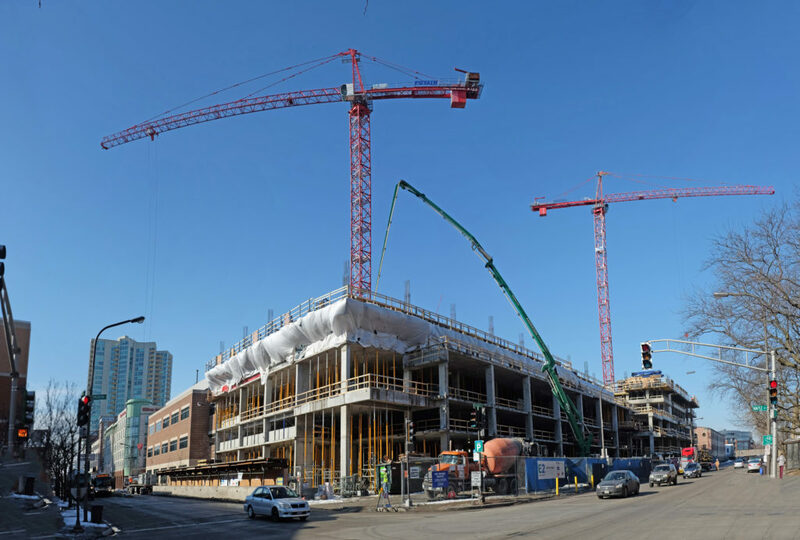 Spring may not have taken a firm hold quite yet in Chicagoland, but construction is well underway on several of FitzGerald’s major commissions for 2014. Read on for photos and updates about West Loop developments Arkadia and CA3, and Evanston’s E2 Apartments. At White Oak Realty’s Arkadia Tower this week, general contractor Power Construction has finished placing the fifth floor of the parking podium and is in the midst of placing the tower’s 16th floor. The building’s signature blue window wall is beginning to come together on the east elevation, and interior partition framing has begun. Visible from Chicago’s bustling I-90/94 corridor, Arkadia’s façade will be a gateway marker welcoming visitors to Chicago’s Greektown neighborhood. Contemporary design elements contribute to a modern but contextual building for the neighborhood, which will include 350 rental apartments in studio, one-, and two-bedroom formats and 20,500 SF of street-level retail space. The building will provide residents with several amenities including a rooftop pool, garden and green roof, dog walk, and community party rooms with fabulous views of the loop. The building is designed to seek LEED Certification and includes a green roof, energy-efficient window-wall system designed to minimize solar heat gain, high-efficiency HVAC and low-environmental-impact materials and finishes. 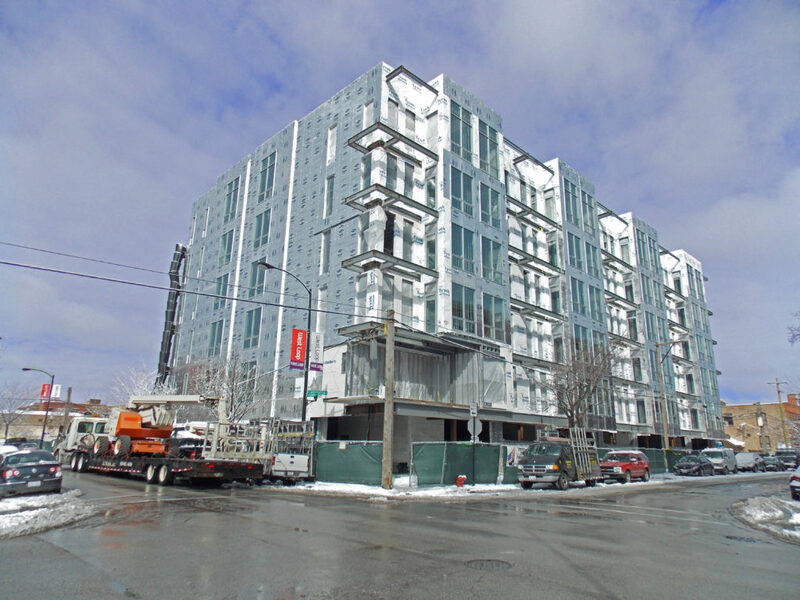 A few blocks west of Arkadia, Belgravia Group’s CA3 has topped out, and Maris Construction is guiding its crews through the completion of the exterior envelope and window installation. The development, which builds on the success of nearby CA23, is a six-story, 40-unit building at Aberdeen and Adams streets in Chicago’s West Loop. The new building shares much with its predecessor, including first-floor secured parking and distinctive through-unit floor plans that provide residents with two private outdoor spaces and city views looking east and west. Second floor units include terraced patios, and penthouses include private rooftop decks. The large floor plans target families and households seeking three bedrooms who are attracted to the urban West Loop neighborhood. 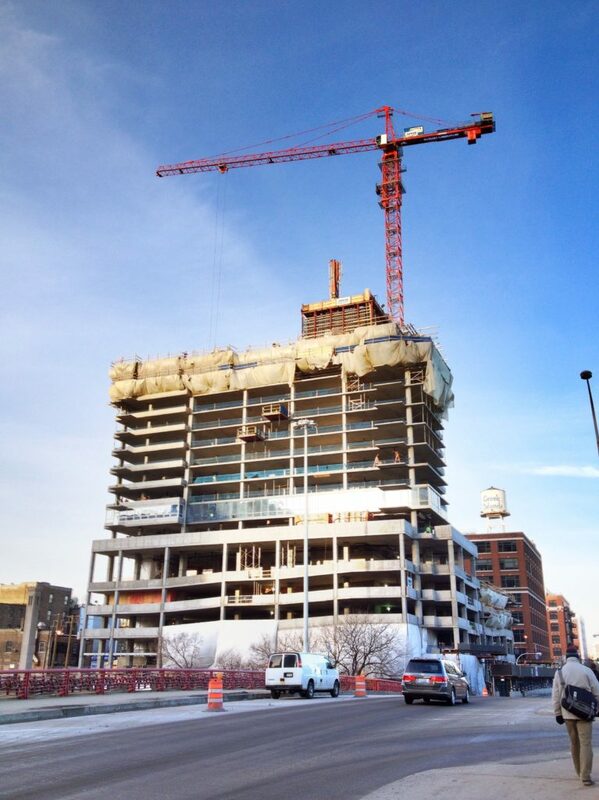 Up in Evanston, McHugh Construction is pouring concrete on Fifield Companies’ E2 Apartments’ fifth floor and beginning to deck the sixth floor. Mechanical, electrical and plumbing rough-ins are being placed in anticipation of concrete casting, and underground construction has been tied in to adjacent utilities. E2’s two towers will stand 16 and 14 stories and will be connected by a four-story structure with parking and rooftop amenities. The two towers will include a total of 356 luxury rentals in studio, one-, two-, and three-bedroom layouts, twelve townhomes along Emerson Street, and about 4,000 square feet of ground-floor retail space. Finishes are designed to appeal to the savviest consumers, with stainless steel appliances, quartz countertops, and high-end lighting and plumbing fixtures. Bluetooth audio systems and electronic access control are also planned for each unit. Building amenities will include a sports court, fitness center, theater and lounge, business center, coffee bar, and outdoor pool and grill area.